Medical cannabis is an increasingly available, alternative medicine that tens of thousands of Americans are turning to in an effort to get relief from their symptoms. Jennifer Collins is one such patient. On Wednesday, Brookings released “The Life She Deserves,” a documentary short profiling Jennifer’s struggle with an epilepsy disorder and with the public policies that have stood between her and the medical intervention her doctors recommended. 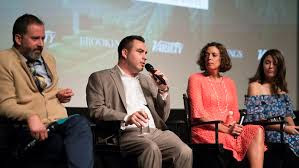 In Brookings’s first use of this medium, the film tells both a personal and a policy story, highlighting the human side of a public policy failure. At a young age, Jennifer was diagnosed with Jeavons Syndrome, an epilepsy disorder characterized by frequent seizures that often present as a fluttering of the eyes. During these seizures, Jennifer loses awareness of her surroundings. Those smaller seizures—which can number in the hundreds per day—can also cluster into a more serious and dangerous grand mal seizure, of which Jennifer has suffered many. With the diagnosis, Jennifer’s doctors began a standard pharmaceutical regimen that ultimately culminated in more than a dozen pills daily and maximum adult doses of powerful anti-seizure medications. Those medicines came with side effects that included mania and suicidal ideation. Ultimately, pharmaceuticals were unable to help with Jennifer’s seizures and the side effects became overwhelming. Desperate for a solution, Jennifer’s parents read online about children moving to Colorado to access non-intoxicating, cannabis-based medicines to treat conditions like hers. “The Life She Deserves” profiles the difficult choices the Collins family faced and explores what many patients and families sacrifice in order to get medical relief. Whether it is for a child with epilepsy, a young woman battling breast cancer, an Iraq War veteran with PTSD, or an elderly woman with chronic arthritis, accessing medical cannabis often requires weighing steep costs against the benefits. Jennifer is a unique individual who has bravely fought both a chronic condition and a dysfunctional public policy system from a young age. 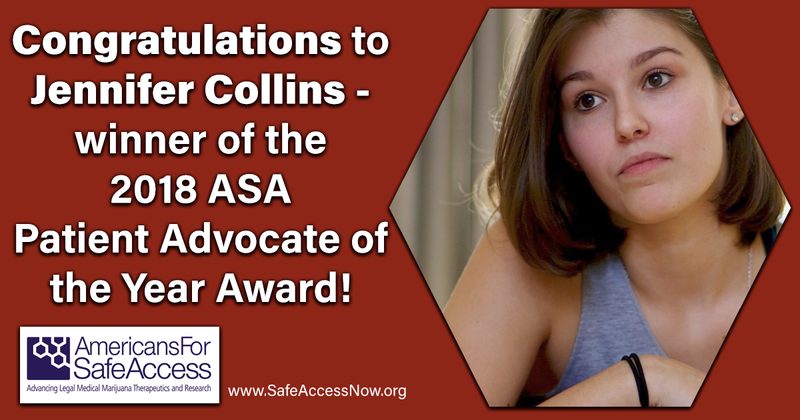 Her story tells us as much about a strong young woman from Virginia facing a significant, ongoing health challenge as it does about a system of laws in which federal policy contradicts both itself and numerous state laws. Her story is one that is relatable to patients and the family members, friends, and colleagues of patients who see what Jennifer and her family have seen: cannabis-based medicines can provide relief in some patients. However, Jennifer’s story is not a unique one. “The Life She Deserves” shows the overwhelming challenges that government can pose when it comes between doctors and patients, researchers and science. The film also highlights what has become a new normal in this country: the medical cannabis industry. Cannabis growers and sellers are not a group of sinister drug peddlers, operating in the shadows. The film highlights how a husband-wife duo responsibly cultivate cannabis in a heavily regulated system. And the seller is a rabbi who, inspired by his father-in-law’s decades-long battle with MS, opened a family business where he dispenses cannabis to a wide variety of patients—just a stone’s throw from the same institutions of government that label him a narco-trafficker. Remarkably, in 2018, the idea of medical cannabis has become normal and mainstream. But as we explore in “The Life She Deserves,” the health challenges that draw people to it are devastating and the failure to implement effective policies forces them to make major sacrifices in order to access treatment they need. 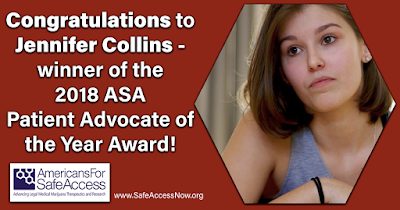 CONGRATULATIONS to Jennifer Collins, Americans For Safe Access 2018 Patient Advocate of the Year Award winner! Learn more about her amazing story and join us at the 2018 Unity Conference to meet Jenn and see her receive the award! Jenn has achieved so much in her young life already, we cannot wait to see what she has in store for the future. We are also happy to be able to screen The Life She Deserves, a new documentary about her achievements as a patient and advocate. It was clear that Brookings needed to explore a new medium beyond the white paper in order to peel back the stigma that continually cloaks medical cannabis. By producing a documentary, we were able to sit across the kitchen table from Beth and Pat Collins, at their home as they shared their difficult journey. We learned what the viewers of this film quickly learn: they’re just two parents who want to give their daughter a normal life. Because of this medium’s ability to create intimacy, the viewer gets see how government policy and the human experience collide to tell a compelling story. And Brookings is in a unique position for storytelling. The institution delivers in-depth analysis that can be presented with the human experience, positive or negative. What Brookings needed was a vehicle for such work. The documentary is precisely that vehicle. In addition to home videos of Jen’s childhood and footage of Beth Collins testifying at the state legislature, maybe the most poignant moments in the film are of silence. In “The Life She Deserves” Jen reflects on the long road she’s traveled and where she is headed. When she pauses to collect her thoughts, in that silence we can see the severity of what she has been through—an emotion that words could not capture. At that moment we get a rigorously honest look at the pain she has experienced and the strength and courage it took to survive and talk about it. This is the power of storytelling and this is the power of the documentary. We live in a time when many in our country—on both sides of the aisle—see many areas of public policy as broken. Like Jen, millions of Americans feel the effects of those policy failures every day. The opportunity for effective policy storytelling has never been greater, and at Brookings we’re looking forward to telling many more. To those familiar with the world of medical cannabis, it is no secret that public policy in this area is broken. We have written extensively at Brookings about the numerous policy problems including banking, taxes, interstate access, and others. 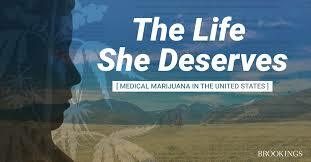 “The Life She Deserves” focuses on some of the most glaring issues facing patients themselves—an often-overlooked area. And the main issue that impacts patients, even more than access, is how little is known about how to maximize the benefits of cannabis to treat different conditions effectively. The U.S. government has made expanding that knowledge extraordinarily difficult. Beyond the U.S. government declaring that the cannabis is illegal, federal policy also adds layers of bureaucracy that make research into the medical value of cannabis much harder. In fact, researching cannabis is more bureaucratically challenging than researching any other substance designated Schedule I—the nation’s highest level of drug control. There is no excuse for a government that makes research more difficult to conduct. Those efforts are anti-science and ensure that politics influences the pursuit of scientific answers. Compounding the problem is that as more states pass reforms that label cannabis as medicine, there is increased demand for answers about the substance’s medical value. There is an ever-present and growing need to ask more questions about cannabis, not fewer. As more patients use this substance in an effort to relieve symptoms, the federal government should be committed to helping understand this area of science. After all, what could the federal government fear from more research? In fact, no one in the nation—regardless of views on cannabis—should oppose expanded research. As we have written before, if you are an avowed opponent of cannabis and believe it is dangerous, it has no medical value, is highly addicting, and is a gateway drug, you should encourage more research that will demonstrate those findings. Those findings would be a wakeup call to many patients and, more importantly, to policy makers at the state level. For those who support medical cannabis and believe it is a miracle drug that can cure everything from a cough to cancer, you, too, should demand more research to demonstrate not simply medical value, but the precise ways in which cannabis interacts with bodily systems to provide relief and cures. Finally, if you don’t really care about cannabis, the current policy should bother you. Federal government intervention in science should terrify you. When government impedes researchers from asking the questions they believe are important and conducting research in ways that their expertise and medical literature suggest are critical, the substance should not matter. The principle matters. In a time of an unpopular president, an embarrassingly unpopular Congress, and trust in government at near-historic lows, who should you trust to steer the ship of science: a physician and medical researcher from Michigan or a guy who happens to represent Kalamazoo in Congress? As Patrick and Beth Collins note in “The Life She Deserves,” one of the biggest challenges facing medical cannabis patients is a lack of understanding about exactly which cannabis-based products assist with which conditions. There is also a deficit of information about dosing, interactions, side effects, and a host of other characteristics that patients are used to knowing about medicines that they take. Part of the blame rests with states moving forward to bring to market cannabis-based medicines without their enduring the normal regulatory processes we expect in the United States. However, much of the blame rests with a federal government that has allowed a racially-motivated, institutionally perpetuated policy overwhelm a commonsense approach that would remove unnecessary bureaucracy from blocking research. Many patients will tell you that there is no question that cannabis helps them (although there are a number of patients who will also say that it does little for them). The biggest question that remains, however, is whether the federal government will stop politicizing research and help facilitate answers to the questions that patients are demanding. The human cost of leaving patients and families to fend for themselves is clear, in Jen’s case as we see in “The Life She Deserves,” and in countless other households.